Leah Kennel Magal’s spirit was evident for her entire impactful life – and will live on in an endowed scholarship at Eastern Mennonite University that bears her name and that of her beloved husband. 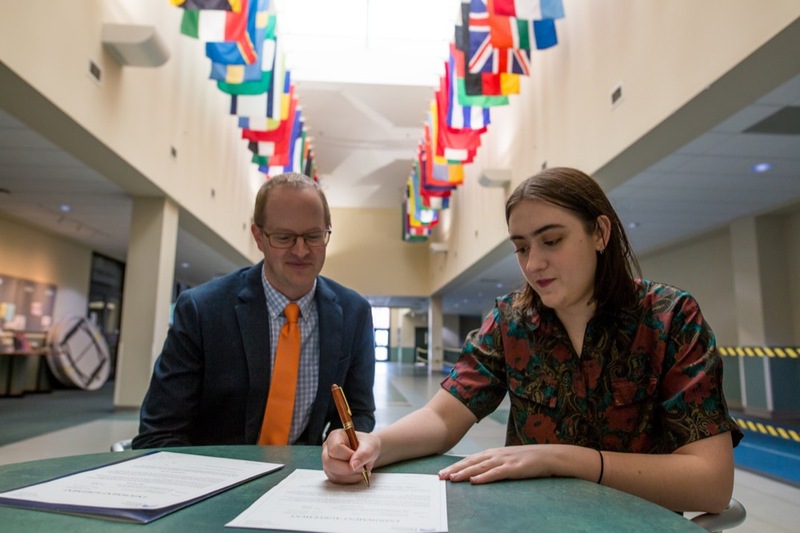 The Dr. Ivan V. Magal and Leah Kennel Magal Endowed Scholarship, which will benefit international undergraduate students, was formalized during EMU’s 100th Commencement weekend by their grandchild Celestyna “Cela” Hoefle ‘19 on behalf of the family. That is, after all, a story that was true in her own life. At age 85, Leah traveled to Thailand with Emily and her husband, who were helping design and build a dental clinic and missionary residence. One afternoon, the couple returned to their car where Leah had been waiting – this was in the middle of a field, with lots of cobras and monkeys around, Emily said – to find she was not there. Emily started to panic, but a local man held out his hands as if on motorcycle handlebars and made the sound of an engine revving. It did, she found out, and after she took some prerequisite high school courses, she studied chemistry. In 1947, Leah met a pre-med student named Ivan Magal, an Eastern European who was among the first international students to enroll at EMU. As Nika recounted in her senior history thesis “Ivan Magal: A Voice of a Friend to a Broken Community” published in Pennsylvania Mennonite Heritage Quarterly and now available online courtesy of Lancaster Mennonite Historical Society, Ivan was born in the Carpathian mountain village of Verecky Nizni, which suffered a series of brutal occupations. Twice his family moved to Belgium, where his mother died and his father struggled before returning to Verecky Nizni. 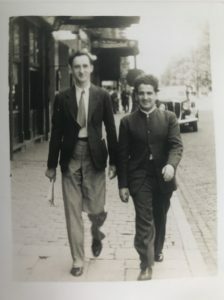 Ivan Magal (left) met Mennonite Central Committee worker Paul Peachy in 1945. Back in Belgium, Ivan met a Mennonite Central Committee worker named Paul Peachey ‘45. If he could get to the U.S., Peachy told him, MCC would help him attend Eastern Mennonite School. Ivan did not speak English when he arrived in Harrisonburg in 1946, but the C.K. Lehman family took him in “as a son,” Emily said; she and her siblings called them Grandpa and Grandma. Ivan graduated in 1948, he and Leah married in 1949, and in the following year, Ivan taught organic chemistry at the college (Leah was one of his students). Then the couple moved to Richmond for Ivan to attend medical school. Around this time deep U.S. suspicion of Eastern Europeans in part resulted in the threat of Ivan’s deportation, but Ivan knew that his return to his Soviet-controlled homeland would mean certain imprisonment or death, Emily said. He was allowed to stay, though, thanks to another Mennonite friend who had connections to a member of Congress who added Ivan’s name to a list of people being granted legal status in a provision added to a sure-to-pass bill. Ivan Magal and Leah Kennel married in 1949. Ivan was passionate about both evangelism and medicine, and in the summer of 1951, the couple traveled across the U.S. and Canada, and learned of the struggles Slavic refugees were facing in new surroundings. Ivan decided he could help, and in 1952, he combined his medical and theological training to begin producing a newsletter, Novij Putj (“The New Way”). 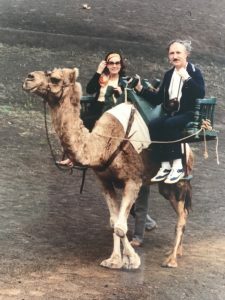 As its circulation grew, Ivan turned to an EMU friend from Canada, Gordon Shantz ‘49, who had honored him in college by starting to learn Russian and would later name his son Ivan. Later, in 1960, eager to expand the newsletter’s impact, Ivan – with the help of Shantz and others – began producing the Mennonite Broadcasts, Inc. program Golos Drooga (“Voice of a Friend”). It, too, featured medical and spiritual content, to evangelize behind the Iron Curtain. Ivan eventually left the role of principal broadcast host to his younger brother Vasil, who was based in Brussels, in order to meet the demands of his growing medical practices — first in Stuart, Virginia, and later in Washington D.C.
Ivan and Leah Kennel Magal in the Cayman Islands in 1982. Through all of their married life, Leah was “the stabilizing influence, the behind-the-scenes person,” Emily said, helping with their first medical practice or supporting the entire family’s travels “every weekend” for Ivan’s preaching engagements, their four children in tow. Leah had finished college just three credits shy of a degree. Though she was later encouraged to return to take the remaining class, it was the learning she’d experienced at EMU that mattered to her, rather than a degree. And she continued to love learning, especially about nature, in extensive travel. 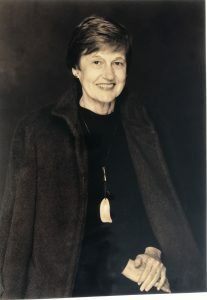 She volunteered for more than 20 years at the Smithsonian Museum of Natural History’s Discovery Center. 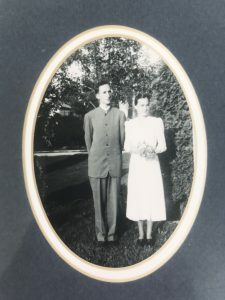 Ivan died suddenly in 1984, and in the early 2000s Leah decided to will part of her estate to the Mennonite Central Committee, Mennonite Disaster Service and EMU. Now, with the advent of the Dr. Ivan V. Magal and Leah Kennel Magal Endowed Scholarship, the family is leaving a legacy – one that will help future international students, too, grow their own EMU roots. As part of the C.K. Lehman extended family, I learned to know Ivan and Leah well. I looked up to and admired them both. They represented everything I wanted to be–kind, warm, deeply compassionate, dedicated to their work, and worldly-wise in a way most of my Park View elders were not. How very fitting that a scholarship has been set up in their names. My only wish is that each student who benefits from it would have had the opportunity to meet their benefactors. What an amazing account of the Magal family, beginning in the late 40’s at EMS. 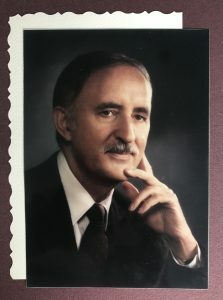 As a very young student in 1950 I quickly learned about Ivan Magal, EMC’s first international student and his outstanding reputation in study and service to the church. Later through some association with members of the Kennel family, I was continually interested in the ministry that the Magals were carrying on in the United States and in his home country. Several decades later in the early 70’s, I personally met their daughter Phyllis, who was an EMC student in a class I was associated with. I certainly don’t expect that Phyllis would remember that class, but it was a connection with Ivan and Leah Magal’s family that I remember with pleasure. I too, like my sister, Kathie Kurtz (above), have warm memories of Ivan and Leah Magal and their family that go back to the early 1950’s. As a granddaughter of C. K. and Myra Lehman, I simply “inherited” the Magals as “adopted” relatives within the Lehman family. And years later, I came to realize that Ivan himself had, entirely without his awareness, connected me with my ongoing search for my own father, someone whom I had never known. While I never had this conversation with Ivan in person, I did send him a letter thanking him for playing this role in my life. I recall attending his memorial service in Washington D.C. in 1984. And when Leah died and her children came back to Harrisonburg to lay their mother to rest alongside their father at the Mt. Clinton Mennonite cemetery, I was privileged to participate in her memorial service. What a beautiful legacy these two people have left through their lives. Thanks to the Magal family for honoring their parents with this named endowment that will bring international students to EMU for years to come. It would be virtually impossible to relate the impact Ivan’s friendship had on my father’s life. By extension we kids received a different worldview than we might have otherwise. Thank you for this beautiful tribute. It seems entirely right that a memorial endowment be made in Ivan’s and Leah’s names. From 1968 to 1971 while I was a resident at George Washington University Hospital, Dr Ivan Magal was on the faculty and became a role model for me as a young physician. We also worshipped together at the Hyattsville Mennonite Church. He showed me by his example what it means to hold together the spiritual and the physical aspects of healing the whole person. How fitting that his and Leah’s legacy will continue to bless future student s!